Horses are the ultimate team players. In the wild, the horse’s survival depends on being in a herd, and everybody within that herd working as part of a team. The herd will have a natural hierarchy and each horse will have a role in that team. This is much like our social groups and organizational teams today. As you and your team members observe horses relating to each other, and as you engage with the horses, you will learn how you lead, follow, communicate and connect with others. 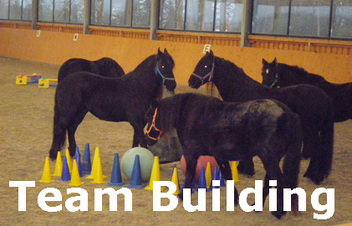 Your team will be asked to step outside of the box of verbal communication, positions of authority or reputation, and connect more deeply with the horses and each other.Put your team's communication and problem solving skill to the test with a number of horse-based activities aimed for you to collectively overcome obstacles. All exercises take place on the ground, so no mastery of riding is required. Practical horse-led exercises are interspersed with group discussion and classroom learning. We will work with you to build an event that meets the vision and goals of your team. Please note that we require a minimum of three weeks advance notice for proposed seminar date(s).